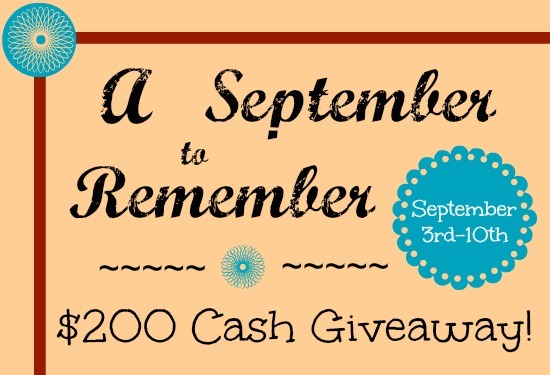 Thanks to a group of fab mommy bloggers, we have a special gift for YOU: A chance to win $200 in a fantastic September to Remember Giveaway! With how quickly the years pass, we want to give you a memorable September, whether you use the money for a special family project, or just to fund a little downtime. This giveaway is sponsored by the clever mom bloggers listed below. They all write blogs that are chock full of ideas, tips, tricks, crafts, recipes, and funny stories, sure to help ease the transition from summer back to school structure. We hope you will take a minute to pop in on some of these blogs, and then enter the giveaway below! Enter for a chance to win $200 PayPal Cash OR a $200 Amazon Gift Card (winner’s choice!). The giveaway is open worldwide, and closes at midnight on Tuesday, September 10th, 2013. The first entry option is mandatory, with everything else being optional. Good luck! P.S. Four to Adore received no compensation for sponsoring this event, nor is she responsible for the delivery of the prize. Prize will be paid in United States dollars. Winner will be notified by email and have 48 hours to respond in order to claim their prize. If they do not respond within the 48 hours, they will forfeit the prize and an alternate winner will be chosen. How awesome that ya’ll got together to do this! So amazing. And yes, with quads $200 will certianly help with the school budget. I know you could use some extra cash. Back to school supplies and clothes x 4 is expensive! I am in aww.. how many moms have time and creativity to blog. So not me…:) But I love to read it . Great giveaway!! Would love to put the money away for a trip with my boys!! I love reading blogs about multiples! I am not ready to be a mom but you all make it look so easy! I’ve lived in eight states! I love reading your blog! As a mom of one plus triplets $200 would come in pretty handy! Would love to win this giveaway to buy Christmas presents for my family. You would certainly make good use of some extra cash. You amaze and inspire me with your 8!